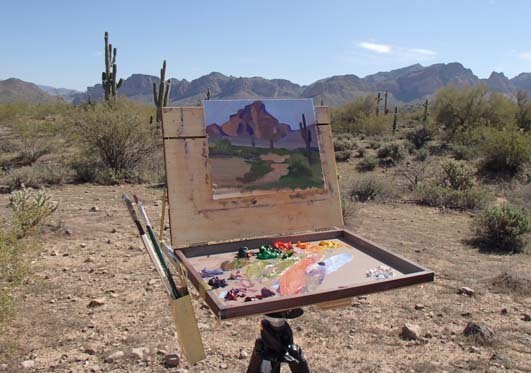 The group of artists was huddled around the teacher as we hiked past, and we found a few of their easels standing unattended between the desert shrubs. We had been trying to capture the spirit of the desert with our cameras for weeks, and sometimes we found it a little elusive to show the majesty of a giant saguaro cactus or the splendor of a colorful and craggy mountain. So we were intrigued to take a peek at how all these different artists were shaping their own images of the desert using oils on canvas. Spring was definitely springing all around us. 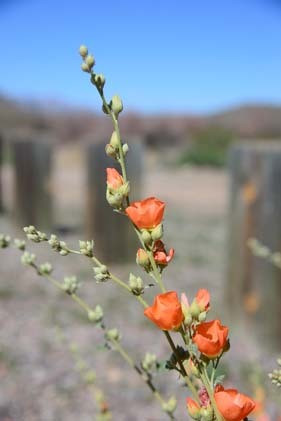 The pretty wildflowers began to show their bright faces, and pairs of birds made their way across the sky. 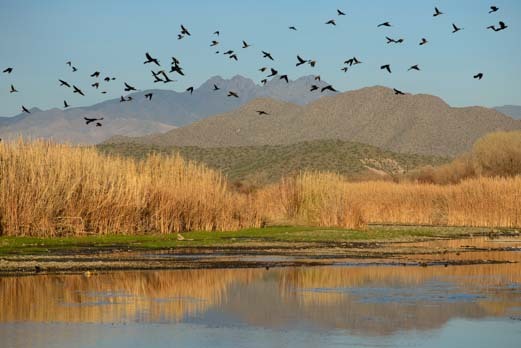 We couldn’t tear ourselves away from the beautiful rivers and waterways of Phoenix, and we kept creeping down to the waterfront again and again to watch the flocks of birds. 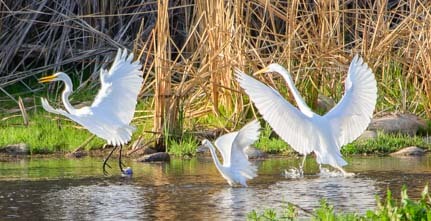 Every morning, like clockwork, just after the sun peeked over the mountains, a flock of snowy egrets would soar past. They seemed to be commuting from their roosting area at the foot of the mountains to their dining areas out along the river upstream. Then in the evening, just after the sun had slipped below the horizon, they would commute home downstream and fly back to their roost. 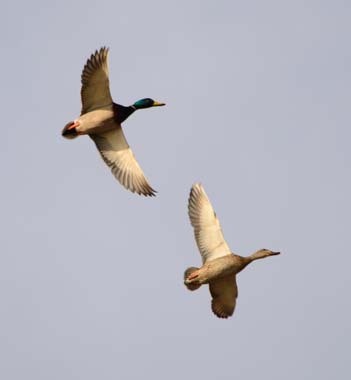 One afternoon I was shocked to look up in the sky and see the flock commuting in the opposite direction from normal. Why on earth were they flying upstream tonight instead of downstream? The skies were black. For a week the weather forecasters had been predicting a deluge of rain, and there was no doubt a storm was on its way. This flock of snowy egrets was very punctual morning and night. This was the first rain in months. 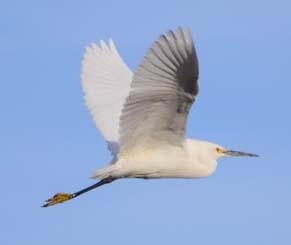 Did the egrets know?? Did they have a “storm shelter” roost they liked better than their usual trees by the mountains? The rain came, and it turned the dusty dry desert into a raging mass of rivers for twelve hours. Then the sun shone brightly again and the air was so crisp it almost crackled. 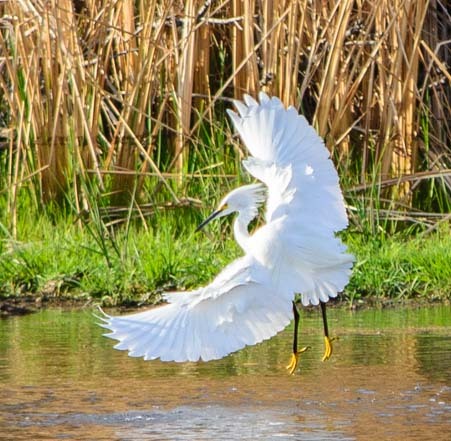 A snowy egret dances in the water. 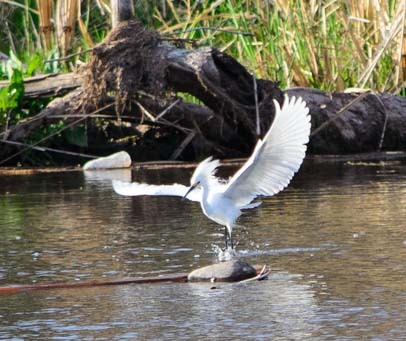 Down at the river, a snowy egret began to dance. I managed to catch him in a pirouette that made him look like the mascot bird for the city of Phoenix. 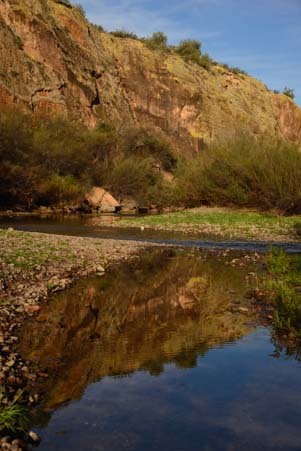 When Phoenix was first settled, the new arrivals discovered that the area had been inhabited by an earlier people who had irrigated the desert by building a maze of canals that diverted the water from the rivers in the area. The settlers named their new city “Phoenix” after the mythical phoenix bird that would regenerate itself by rising from the ashes of its predecessor. In the same way, the city of Phoenix rose from the ashes of a Hohokam city built centuries before. 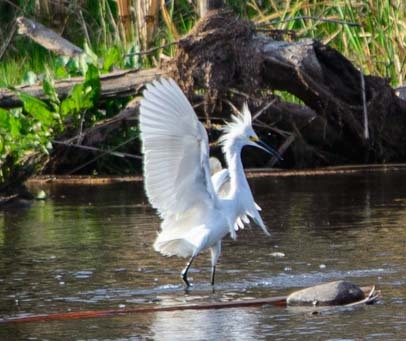 But the little dancing snowy egret (with yellow feet) had no idea he was channeling the Phoenix. 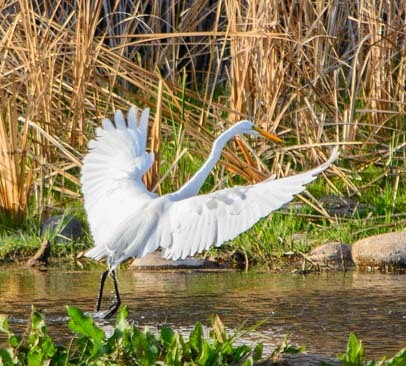 He was joined by a great egret (with a yellow beak), and the two of them began a bouncing ballet of featherlight steps in the water. Their wings were so big and their bodies so light that their feet hardly seemed to touch the ground as they leaped and pranced in the water. The ballet was all about fishing, of course. At least, there was quite a bit of fish spearing (and catching) going on as part of the choreography! But the beauty of their movements, especially as they postured and posed at each other, and then turned their backs on each other, and then faced each other once again, was truly elegant. Ballet choreographer George Balanchine had nothing on these guys. 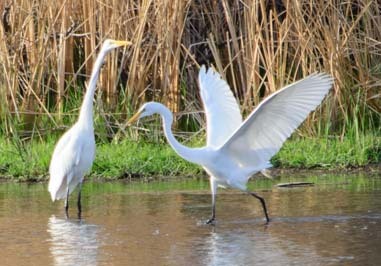 The egrets catch the morning sun in their own performance of Swan Lake. Grackles take off for an aerialist jig. Not to be outdone, the mallards and Mexican grackles joined the fray too and turned it into more of a dance hall boogie. But even with the noise of the grackles as they squawked in the trees and bathed in the water, and even with the brightly colored feathers of the male mallards flashing in the sun whenever they took wing, for me, the egrets really stole the show. 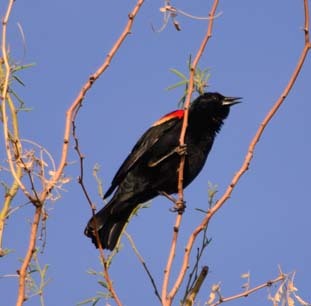 A flock of red winged blackbirds sang morning and night by the river. 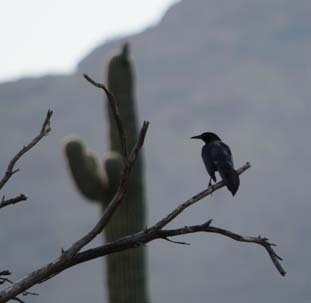 The waterways of the southwestern deserts are full of all kinds of birds — red wing blackbirds, cormorants and killdeer — and we saw quite a few osprey as well. 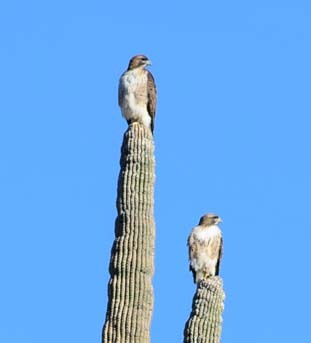 One pair used a saguaro cactus as a lookout tower every morning. It was amazing that, if they were left undisturbed, they could sit on that cactus for hours each morning, silently surveying the scene around them. The coveted bald eagle sighting! The prize sighting for everyone spending time around the Verde and Salt Rivers, though, was the bald eagles. 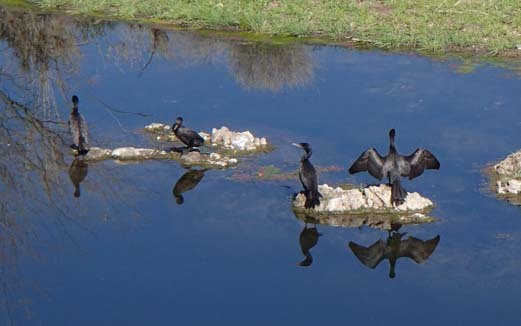 Cormorants dry their wings after a morning of diving. The thing is, the bald eagles didn’t come by and tap us all on the shoulder to say “hi” every time they flew past. 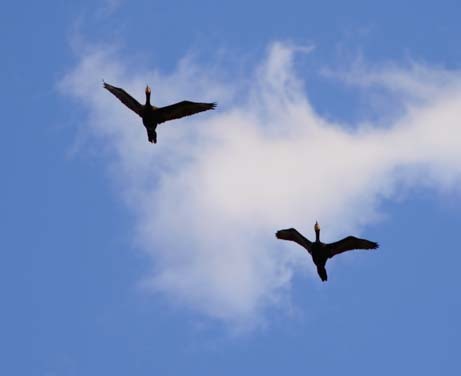 They just went about their daily business, totally unaware that they were the prize sighting, and it was up to all of us to notice when they appeared in the sky. 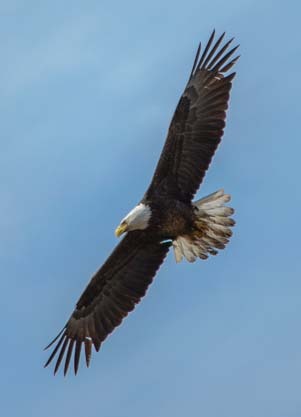 There were a few times when I got lucky, and I managed to catch an eagle on the wing as he soared in sweeping circles across the sky. 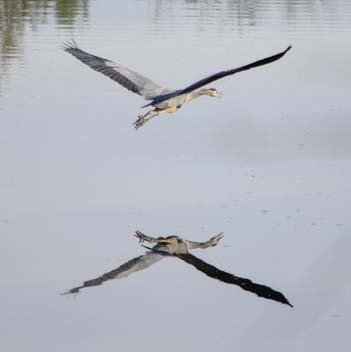 The still water catches the reflection of a great blue heron’s wings in flight. 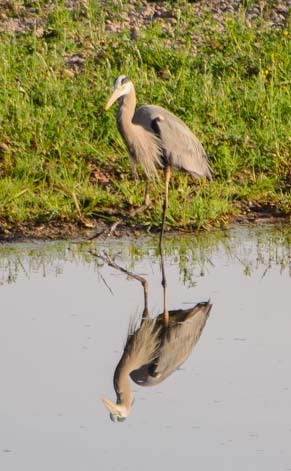 A great blue heron came down to the water’s edge and looked for all the world like he was admiring himself in a mirror. I’m sure he was actually scanning under the surface for fish. When he finally turned and began to fly away, his outstretched wings made a beautiful reflection on the water. The red baron did somersaults — but I missed it! 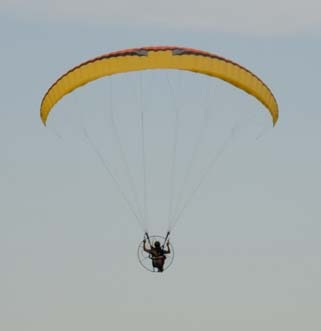 Up in the sky, manmade flying contraptions passed by every so often. 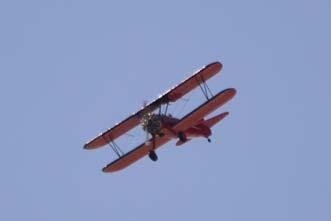 A red biplane has been giving tours over the Scottsdale area for years, and it flew over us several times. Oh WOW!! 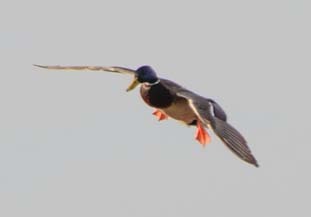 But darn, it was too late… by the time I found my camera and got ready to shoot, he had done his last somersault. Our days were positively languid and milky as one blossomed into the next. Time seemed to hesitate until it stood totally still. For the first time since we started traveling seven years ago, we were able to visit at length with old friends. Rather than a rapid “hello-goodbye” as we dashed through town on our way between ocean adventures and land based ones, we stayed put and got our feet firmly planted back on the ground. I think that for anyone who travels full-time, after a few years it really helps to stop and take stock and regroup. Round-the-world sailors often spend a year based at a foreign port — New Zealand or Australia, or in the case of one family I followed in the early 1990’s, Cairo. Stopping — or at least pausing for a bit — can be a vital part of traveling. But the days were getting warmer and we were beginning to hear the siren call of new destinations. A desert sunset glows pink for a split second before fading to grey. Did you enjoy this post? Subscribe and enjoy more pics and stories as we travel! 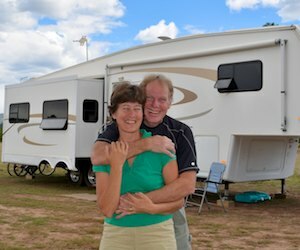 This entry was posted in Arizona and tagged Arizona, Arizona Animals, Arizona Central, Arizona Phoenix East, Birds, Birds and Wildlife, Desert and Water, New, Travel, USA, WP Travel by Roads Less Traveled. Bookmark the permalink.